Synopsis: The kingdom of Goredd is populated by humans and by dragons who fold themselves into a human form. Though they live alongside each other, the peace between them is uneasy.But when a member of the royal family is murdered, and the crime appears to have been committed by a dragon the peace and treaty between both worlds is seriously threatened . . .Into this comes Seraphina, a gifted musician who joins the royal court as the assistant to the court composer. She is soon drawn into the murder investigation and, as she uncovers hints of a sinister plot to destroy the peace in Goredd for good, finds herself caught desperately in the middle of the tension.For Seraphina hides a secret - the secret behind her musical gift - and if she is found out, her life is in serious danger . . .
Dragons were what first got me into reading and dragons are what often inspire me to return to high-fantasy again and again, though I am always cynical of picking up such novels because even though there are some fantastic novels in the genre, there are also legions of utterly awful attempts at fantasy fiction. Seraphina has been no different: it’s been on my shelf for about six months and has taken me two copies and glowing reviews to finally pick it up. I’m glad I did: this is unlike every dragon novel I have read so far. From the outset, creatures previously admired and unoriginal in high-fantasy are portrayed in a traditionally mediaeval light: as fire-breathing, menacing villains out to steal fair maidens and pillage your gold. What Hartman adds, though, is a transformative ability that allows dragons to enter a human-form and a deeply entrenched detestation of all things emotional. Of course, both the dragons’ view and the view of the dragons changes throughout Seraphina and becomes a central part of the novel, both thematically and plot-ically as both the dragons and citizens of Goredd have a general disdain and distrust for one another, even in the forty year aftermath of a peace treaty. Seraphina could be categorised in a number of ways but the one that feels most comfortable to me is that it is a political thriller with dragons. Seraphina, our young (but surprisingly ageless) protagonist is a closeted half-breed: closeted because it is taboo to be of mixed-species-descent and half-breed, because her mother, unknown to her father, is a dragon; and thus is unwelcome both by dragon and human society alike. As an outsider, she has an untainted perspective of both sides, so when the fragile peace treaty is threatened by both disgruntled humans and angry, conservative dragons, she is one of the few who sees its real value. Couple that with courtly life – she is a music mistress – and her unique access to the heir to the throne, and she is in the perfect but perhaps undesirable position of being able to influence draco-human politics. It isn’t all politics, though: Seraphina encounters a bitter-sweet, touching romance that doesn’t overwhelm the novel but still conveys the feelings of falling in love wonderfully, and her relationships with both Prince Lucian and his fiancé, Princess Glisselda, as well as that with her dragon-uncle Orma balance the novel wonderfully, and Hartman’s characters really are standout. Hartman’s excellent prose only manages to compound this: Seraphina is one of the best-written high-fantasy novels I’ve read yet. 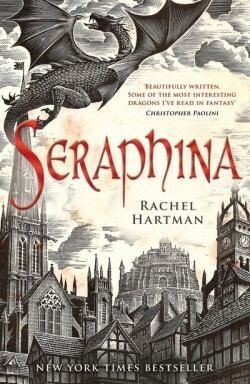 In a genre bristling with derivative works and awful teenage fanfiction, Rachel Hartman’s début Seraphina is like a breath of fresh air after being acclimatised to a horrible smell – unexpected and utterly wonderful.